"I had no preconceptions about the programme when I joined it… I only knew I did not want to be like the Doctors who had gone before. However, the old producers wanted me to play it for laughs, you can see that in the first episode. The hat business. The shower. I had already decided I want to play it straight. Luckily those producers left after the first story and were replaced by Barry Letts who let me play it my way…"
Doctor Who‘s showrunner and head writer, Steven Moffat, replies to DWM readers’ questions on Vastra’s lips, River’s name and his favourite story from each and every Doctor. Some of his answers will surprise you…! Amy and Rory. The Doctor and Rose. Captain Jack and everyone. Yes, just in time for Valentine’s Day, Jonathan Morris turns down the lights, gets out the choccies and takes a romantic look at Doctor Who‘s greatest love stories! DWM uses its beryllium atomic clock to turn back time to 1996, and the momentous evening that Doctor Who returned to TV, starring Paul McGann, as Countdown to 50 continues. The Third Doctor faces certain death, while giant arachnids plot to invade the Earth! The Fact of Fiction brushes off the cobwebs from 1974′s Planet of the Spiders, Jon Pertwee’s final adventure as the Time Lord, and uncovers a wealth of new information and rare photos. Remember last Christmas? It can be fun time if you're a fan, with Doctor Who goodies galore – but what if you're a parent? Will your kids share your passion? Jacqueline Rayner reveals what happened to her and her family over the festive season in Relative Dimensions. KNOW ME! AM I... THE DOCTOR? 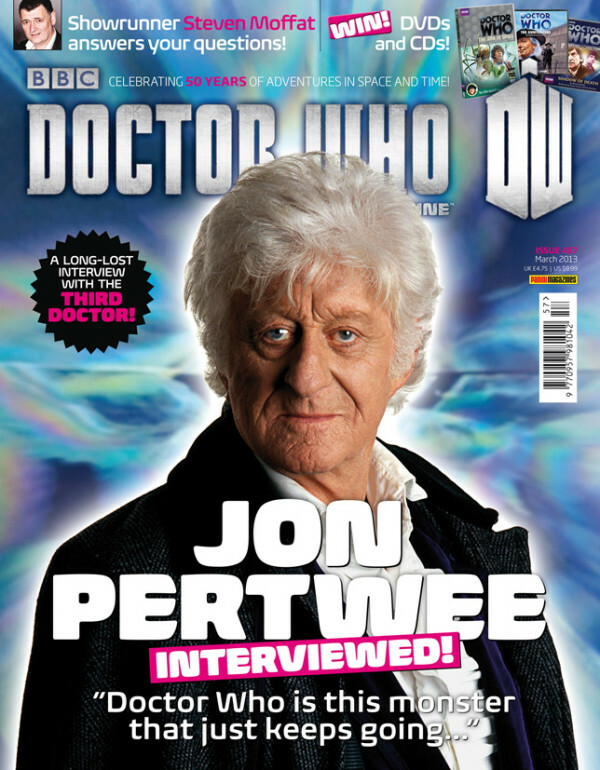 The all-seeing Watcher discusses the delights of Jon Pertwee's seminal single, Who is the Doctor?, challenges readers with a poptastic Six Faces of Delusion and celebrates another Supporting Artist of the Month, in Wotcha! All the latest official news, reviews and previews, a prize-winning crossword and competitions and much, much more! 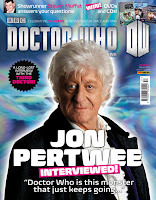 The Official Doctor Who Magazine, Issue 457 is released Thursday 7 February 2013 priced £4.75.